Where’s the ideal destination for a family trip with your parents? How about places you can enjoy with children? We introduce five perfect spots in Tochigi, just two hours by train from Tokyo, including Edo Wonderland and Shiobara Onsen Village! Tochigi Prefecture is a popular sightseeing area accessible in about two hours by train from Tokyo. It’s filled with places ideal for a family trip with your parents or with children! In this article, we’ll introduce five of our most recommended spots. 1. Travel Back in Time at EDO WONDERLAND! Many people dream of time travel. EDO WONDERLAND Nikko Edomura is where that wish will come true! In EDO WONDERLAND Nikko Edomura, a recreation of an Edo period town, you’ll find a shopping district, samurai residences, and ninja villages. People dressed in Edo period clothing walk around the streets. When visiting EDO WONDERLAND Nikko Edomura, you can also put on Edo period clothing and time travel back to the past! At Jikuu, you can transform into a merchant, samurai, noblewoman, or feudal lord. In the Edo village, you’ll find a facility where geta (Japanese wooden clogs) and ukiyo-e (woodblock paintings) are on display. There are also areas where you can try making senbei rice crackers, play the shamisen (*1), and have your makeup done Edo period style. *1 Shamisen: a three-stringed traditional Japanese musical instrument. You can also enjoy stage performances in the village. There’s a ninja show with realistic action featuring lights and music, a romantic comedy about a beautiful oiran (*2), and a period drama about the punishment of a villain. The Oiran Courtesan Procession, an event where visitors can see the oiran courtesan performing a ceremonial walk, is another must-see! *2 Oiran: a highly ranked courtesan during the Edo period. This is one of the most internationally leading racing circuits in Japan, located right in Tochigi. TWIN RING MOTEGI, the Japan venue for the annual FIM Road Racing World Championship Grand Prix (MotoGP), attracts road racing fans from all over the world. You can also enjoy other activities in addition to motorsports at TWIN RING MOTEGI. Mobi Park is an amusement area where children can drive all types of motorcycles and cars. They can also make their own driving license. This is great fun for kids! At the Honda Collection Hall approximately 300 wheeled vehicles made by Honda, a Japanese motor manufacturer, are on display. You can also try assembling an electric cart here yourself. The circuit is also filled with fun for adults, including Hello Woods’ zip lines (Mega Zip Line TSUBASA and Forest Zip Line MUSASABI) in a huge forest, and a chance to drive a car on a real racing track. There are also restaurants, a hotel, and a camping area at TWIN RING MOTEGI. Play your heart out at the circuit with your family! The surrounding valley at Shiobara Onsen Village transforms into red hues in the autumn. This is an ideal destination for relaxing with your parents. Momijidani Bridge is Japan’s largest non-stiffening girder suspension bridge. It is a famous and popular autumn spot in Shiobara. You can take in the beautiful gradation of colors of the reddening valley from the bridge. The area has a romantic atmosphere and is believed to be a good spot for couples. This is sure to help your parents remember memories of their dates together. Café Restaurant Yoto (Japanese) is a popular restaurant on the second floor of Shiobara Imagination Archives in Shiobara Onsen Village. At the riverside tables you can enjoy your meal with a view of Kurenai Bridge, a bridge surrounded by fiery red leaves. When you visit an onsen area, you just have to go to a hot spring! We recommend the footbaths for those who don't want to go into a bathhouse. Yuppo no Sato (Japanese) is especially fun and is Japan’s largest footbath facility. The baths here differ in temperature depending on the area. Sit in the area with a temperature right for you, soak in the footbaths, and enjoy viewing the foliage. To access Shiobara Onsen Village, you can take the bus from Nishi-Nasuno Station. By using the Shiobara Valley Free Use Ticket (Japanese), you’ll be able to ride the buses in this region as much as you want for a day and will be able to see other spots as well. Access From Nishi-Nasuno Station on the JR Utsunomiya line, take the JR Bus bound for Shiobara Onsen (塩原温泉) for approximately 42 minutes. Or take the JR Tohoku bullet train-Utsunomiya Line to Nasu Shiobara Station and take the JR Bus bound for Shiobara Onsen for approximately 65 minutes and get off at Shiobaramon-mae and walk for 2 minutes. The town of Mashiko is famous for its Mashiko ware. This pottery has a history of over 160 years and is recognized for its luster and slight thickness. Mashiko also strives to preserve its traditions while keeping up with contemporary technology and designs. The variety of creations, made with a fusion of traditional and new methods, are popular with all ages of customers. In fact, families traveling together often visit Mashiko. In Mashiko, cafés fused with shops carrying Mashiko ware are common, allowing customers to find goods to their liking while they take a break. Kokoro (Japanese) is a café where you can enjoy food and drinks served on Mashiko ware. The dishes, with their calming hues and sturdiness, will help bring out the flavor of sweets and keep your drinks warm. The café sells Mashiko ware made by the owner and local potters. You will find various styles, including modern patterns and simple designs. A large pottery fair is held during the spring and autumn in Mashiko. Bring your parents here and discover treasures! Shopping is a necessary part of your itinerary, even on a trip with your parents or with children! Sano Premium Outlets, an outlet inspired by America’s east coast, contains over 170 stores. Some of these include Western-style clothing, accessories, household goods, and Sanrio, a brand selling character goods popular with children. You can also purchase European brands such as Gucci and Prada for reasonable prices. This is a shopping outlet that appeals to people of all ages. In addition to the outdoor rest area, the outlet also has restaurants and cafés that allow you to enjoy shopping while taking breaks. The outlet also offers a delivery service to all regions of Japan. Every season there is something fun to do here. For example, the outlet is decorated in a strawberry theme in the spring, and romantic illuminations light up during the winter. Special discounts for international tourists are available at Sano Premium Outlets. You can receive the coupon book by simply showing your passport to the staff at the service center. It is useable at all participating stores within the outlet. Buses going directly to Sano Premium Outlets depart every day from Tokyo Station, Shinjuku Expressway Bus Terminal, Haneda Airport, and Narita Airport. It is also convenient to travel to Ashikaga Flower Park, a popular theme park, from Sano Premium Outlets. Tochigi – Full of Sightseeing, Hot Springs, and Shopping! 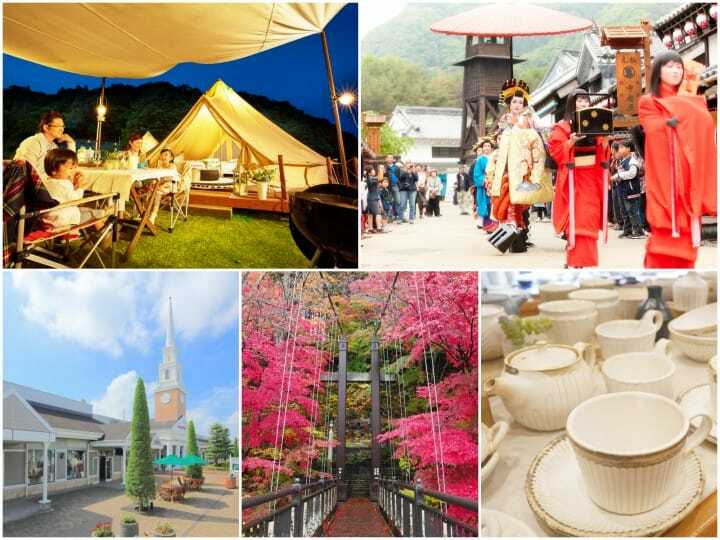 Tochigi is a prefecture enjoyable by families and visitors of all ages, with wonderful sightseeing areas, hot springs, theme parks, and shopping spots. How about making plans for your next family vacation?